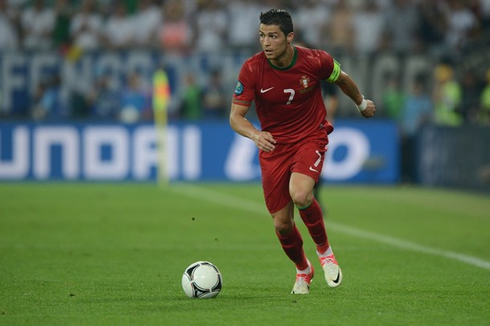 ﻿ Is Cristiano Ronaldo still capable of shining at the EURO 2012? 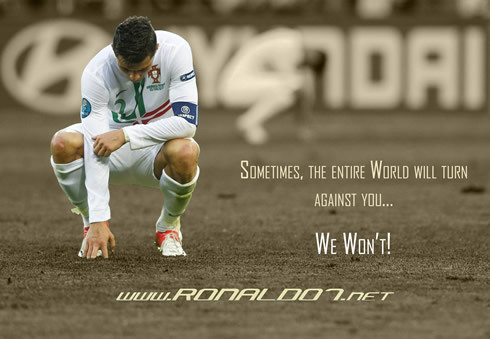 16.06.2012 » Is Cristiano Ronaldo still capable of shining at the EURO 2012? Cristiano Ronaldo has been under fire for multiple occasions in the past, but over the last days, he was forced to face the wrath of almost an entire nation. Despite the win against Denmark this last Wednesday, Ronaldo seems to have become the public's enemy number one, as well as the main responsible for everything going wrong with the Portuguese National Team. From this point onwards, only a good performance against the Netherlands this Sunday will calm down the critics and ease things for the Portuguese star. It isn't exactly shocking to affirm that the first two games from the Portuguese Team at the EURO 2012 have triggered an avalanche of criticism upon Cristiano Ronaldo. Even though nothing is yet decided at this point, at least in terms of knowing who will get through to the tournament's quarter-finals, we've all seen Ronaldo being locked as a target by all kind of newspapers, football commentators or random celebrities. The main reasons behind this unparalleled criticism have to do particularly with two goalscoring misses Ronaldo had in the last game against Denmark and that could have led to a compromising loss or draw. Into what extent is it fair to say that Cristiano Ronaldo is falling short to everyone's expectations because of him not being not capable of handling the pressure coming from an entire country? Can we really compare his performances' level in Real Madrid with his displays for Portugal, having in mind the striking difference there is in terms of the players who surround him in each team? No one can deny that Ronaldo numbers for Portugal are far from his records pulled off at Real Madrid. Justifying it with the idea that CR7 doesn't get thrilled or sufficiently motivated when playing for his country, seems more of a complete devoid of sense than anything else. Recently promoted to captain in the Portuguese team, Ronaldo is often accused of not being the perfect role model both on and off the pitch, as every now and then, he ends up showing signs of what many critics strive to call a lasting imaturity. In the past three seasons in Real Madrid, Cristiano Ronaldo has scored an impressive amount of 146 goals out of 144 games (1.01 goal per game ratio). Within the same time range (from August 2009 until today), Ronaldo has found the back of the net in 9 times out of 35 appearances, when playing for the Portuguese Team (0.26 goal per game ratio). The difference in the numbers is conclusive and it seems hard to believe that a player who has started representing his country in 2003 and already counts with 92 caps for the Portuguese National Team, can keep being affected by the pressure of wearing the Portuguese jersey. He has certainly proved in the past that he is capable of handling the high demands in top clubs such as Manchester United and Real Madrid, so we're surely dealing with something a bit more complex than a simple pressure handling problem. What we also have to bear in mind though, is that the type of pressure one player feels when playing for his home nation is probably significantly different from the one he gets when playing for a club, as there is an important emotional dimension affecting Ronaldo when playing for Portugal, which will always tend to be hard to measure. Moreover, the fact that an entire country is relying on a single player to solve every problem the team faces, may it be a tactical one or simply regard to the lack of quality in their game, will simply result in making Ronaldo the scapegoat of any setback that the Portuguese team may fall into. If we resist to the idea of narrowing our analysis exclusively to Ronaldo, we can easily spot a few significant differences in other factors, that may or may not help us explain why the Portuguese star struggles to make an impact when he represents his country. We probably won't be far from being right if we state that Portugal and Real Madrid actually play in very similar tactical systems concepts (a dynamic 4-1-2-3). However, if we then look at the players one by one, I'm afraid we'll all come to the same conclusion: the quality of the players surrounding Cristiano Ronaldo in Real Madrid is reasonably higher than the quality of the players in the current Portuguese National Team. We could start by comparing Genoa's Miguel Veloso and Real Madrid's Xabi Alonso, but to be honest, there aren't many players in the game who can actually look good when being selected for a head-to-head comparison with the Spanish playmaker. Veloso is no exception in that department. When looking at the other usual Real Madrid midfielders, Khedira and Mesut Ozil, we're forced to compare them with Chelsea's Raúl Meireles and F.C. Porto's João Moutinho. Now some will probably point to the fact that Meireles actually plays for a big side who has recently became current European Champions [Chelsea FC] and that it should be single-handedly enough of an evidence of his high quality as a midfielder. I will have to disagree as I can't see Meireles being more than an average hard-working midfielder, despite his good passing quality shown with often inconsistency throughout the season. 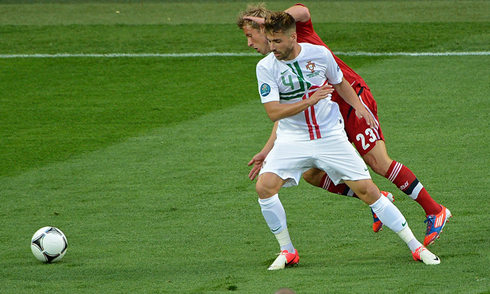 As for Moutinho, he's definitely a very talented player especially in a short passing playing style game, but having in mind who are his usual partners in midfield, the Portuguese player also ends up struggling to find solutions to serve the attacking players propperly and with enough space to create dangerous situations for their opponents. We then get to the attacking sector, where we basically are asked to compare Real Madrid's trio Di Maria, Benzema and Ronaldo, with the Portuguese team's ideal attack of Nani, Hélder Postiga and once again, Ronaldo. We can probably rank Nani and Di Maria very similarly, even though they have slightly different characteristics. They both like to take on defenders, as well as assist teammates with precise crosses. It seems safe to say that they are some of the best wingers this game has to offer and it won't be on this direct comparison that Portugal will fall short to Real Madrid. However, one of the critical issues concerns the center forward position. While the Merengues can count with either Karim Benzema or Gonzalo Higuaín, Portugal usually has to rely on Zaragoza's Hélder Postiga, or Besiktas' Hugo Almeida. It won't be shocking to anyone if we say that Real Madrid choices are two world-class strikers, while the Portuguese options are far from reaching a minimum quality standard for a team who wants to aspire winning an important trophy such as the European Championship or the World Cup. Bottom of line is that there is much more than a single reason for why we're not seeing the best of Ronaldo when playing for Portugal. As I've tried to approach in the paragraphs above, the Portuguese player is dealing with multiple issues concerning an excessive amount of pressure and responsability. Despite his own insistence that this pressure doesn't even affect him slightly, Ronaldo's recent statements and reactions regarding some Messi chants and provocations from fans during the EURO 2012, just prove that the Portuguese star is still struggling to focus in what really matters. The Portuguese team itself is also on a reasonably lower level when compared to what Ronaldo can find in Real Madrid and when that happens, not even the best player in the World (or the most complete at least) can stand out and make the difference. No one doubts that Ronaldo has in himself what is necessary to still shine in this tournament, but in my view, it will all depend on the response the Portuguese team can give as a whole this Sunday, against the Netherlands. 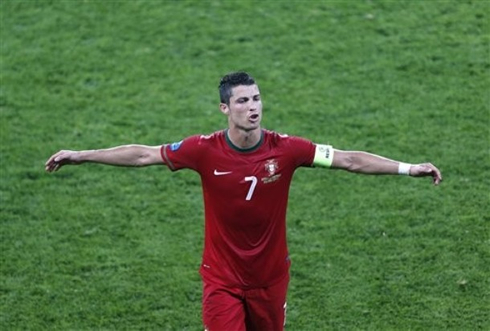 A victory there, as well as a good performance from Ronaldo, will probably lessen the pressure on the Portuguese star's shoulders for the the remaining games of the EURO 2012 and will hopefully allow us to see a more prolific Ronaldo in the knock-out stages. Real Madrid's season is now over and there are no games left in their schedule until the pre-seasons starts by July. Cristiano Ronaldo is now with the Portuguese Team, in the EURO 2012, and the next game will be against Holland, next Sunday (June 17). You can watch Juventus live stream, Portugal vs Holland, Greece vs Russia, Germany vs Denmark and Czech Republic vs Poland, all from our football live streams section. 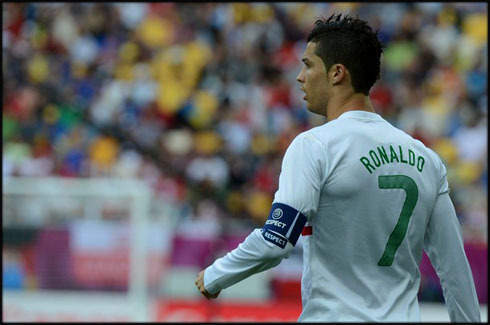 Cristiano Ronaldo is expected to be on the starting eleven, when Portugal decide their fate in their game against the Netherlands, for the EURO 2012 group stage final fixture.